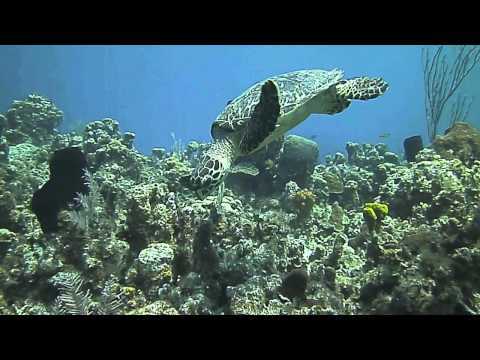 During our dives on Cayman Brac, we were fortunate to see many turtles. This one in particular was really friendly and didn't mind being followed. They are such gentle creatures…. 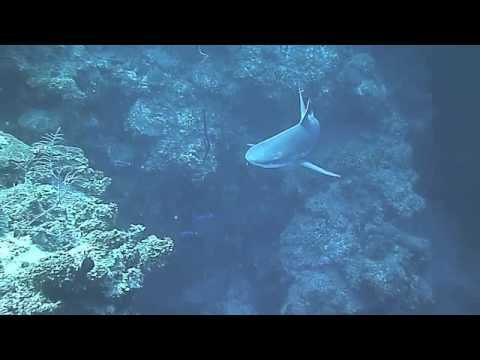 On one of the wall dives on our recent trip to Cayman Brac, we spotted this shark swimming along the wall. We also noticed it had a hook and section of steel leader hanging from it's mouth…. We’ve just completed the final arrangements for a trip to Anthony’s Key Resort on Roatan, for the week of February 1-8, 2014. It’s a complete package, with airfare from Milwaukee, diving, meals, and lots of extras that will help chase away the winter blues. We may also do some diving with dolphins and sharks while we’re there! As many of our customers who have traveled with us know, our trips sell out fast, so don’t delay getting your deposit in! For information, check out our Trips Page, or call Colin at the Delafield store 262-646-8283. You can observe the navigational pattern of sharks that have been tagged with satellite tracking technology all for the purpose of shark conservation.